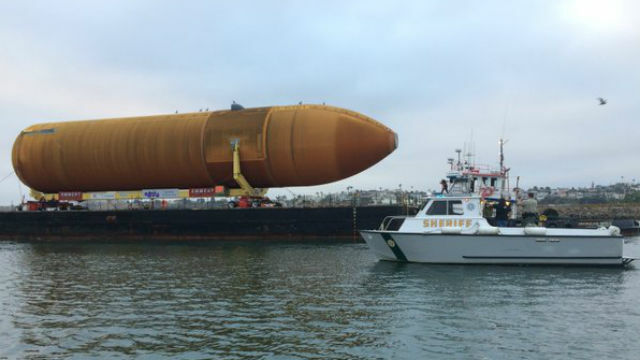 A barge hauling a 66,000-pound external fuel tank designed for one-time use in launching a space shuttle arrived Wednesday morning in Marina del Rey on its way to the California Science Center. Known as ET-94, the fuel tank arrived around 6 a.m. on a barge dragged by a tugboat. The tank will ultimately be placed in an upright display with the retired space shuttle Endeavour, which made a similar trip through the city in October 2012, attracting thousands of spectators lining streets from Los Angeles International Airport to Exposition Park. The massive orange tank began its journey to Los Angeles on April 10, when it was pulled out of NASA’s Michoud Assembly Facility in Louisiana. Two days later, it was tugged into the Gulf of Mexico to begin a voyage that took it through the Panama Canal. The sea journey made some headlines last week, when the crew of the tugboat pulling ET-94 helped rescue four people who had to abandon a sinking sportfishing boat off the coast of Baja California. Now that it’s in Marina del Rey, the tank will be placed on dollies and prepared for its overland journey, which is scheduled for Saturday. ET-94 is NASA’s last remaining shuttle external tank. Unlike the solid rocket boosters and the shuttles themselves, the orange external fuel tanks were never re-used. Typically, they broke apart before they came down in the ocean. But ET-94, having never been used, will be assembled in an upright display with Endeavour at the California Science Center. “With the transfer of ET-94 from NASA, we will have the ability to preserve and display an entire stack of flight hardware, making the Samuel Oschin Air and Space Center an even more compelling educational experience,” said Science Center President Jeffrey N. Rudolph. “With the same outpouring of community support we saw with the arrival of Endeavour, we look forward to celebrating this gift from NASA as it journeys from the coast through city streets to the California Science Center,” he said. The 13- to 18-hour trek through Los Angeles is scheduled to begin before dawn Saturday. The caravan will travel — at about 5 mph — down Lincoln and Culver boulevards, to Westchester Parkway, then through Inglewood on Arbor Vitae Street to La Brea Avenue, past the Forum, and north on Vermont Avenue to the museum. The tank, the only major, non-reusable part of the space shuttle, is neither as wide as Endeavour, nor as high, although it is longer. Because of its size, fewer utilities will be affected and no trees will be removed along the route from the coast to Exposition Park, though some light trimming may be necessary, according to the museum. The 16.5-mile path it will take through the streets was planned with input from city officials, utilities and community groups.